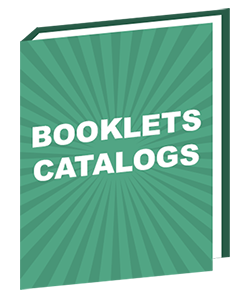 Year after year, Breakaway Press continues to produce high quality booklets, catalogs and brochures for a wide variety of clientele. From simpler folded brochures to a 100+ page catalog, we have the staff and knowledge necessary to create excellent products that meet any need. And any combination you can think of! Need your booklets, catalogs or brochures shrink-wrapped and delivered conveniently packaged in clearly labeled boxes at your door? We have that covered. Need to take it one step further and have your booklet, catalog or brochure warehoused, fulfilled on demand or mailed? Absolutely! Check out our fulfillment and mailing pages! Get started by sending us your project details!